Choosing a basic website template with white background for your fashion blog doesn't mean that it would be dull. Featuring a completely streamlined look, this design makes viewers focus strictly on photography and fashion news. Like a fashion store window, your site will look bold and exciting, engaging visitors and encouraging them to come in and look around. Here fashionistas will be able to find whatever they wish from common posts about the latest fashion trends to photorich galleries and catwalk reports. Our designers have put a lot of thought into organization and structure of this theme. Even though it is contentheavy, visitors won't face any difficulties with navigating though your page owing to its wellplanned and balanced layout. Pick it to keep people informed on the world fashion news. Will TemplateMonster help me to install my WordPress theme for Arts? 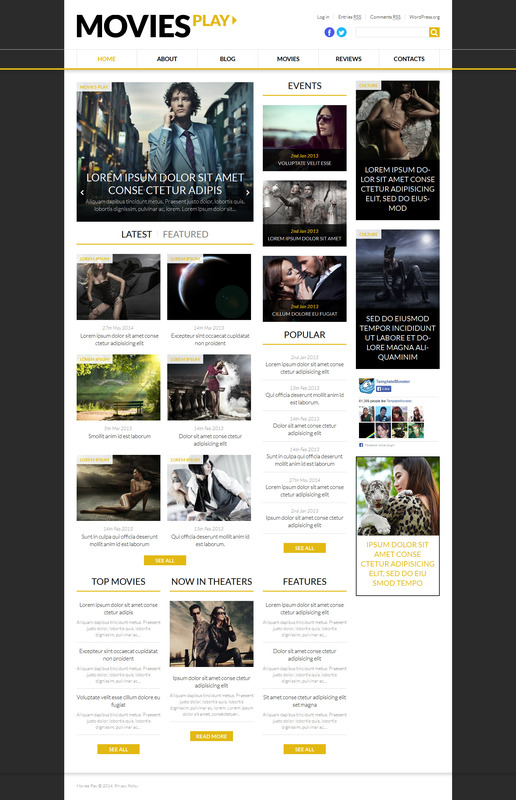 If you purchase the product at a â€˜Unique price' it guarantees that you are the first and the last person to buy this WordPress theme for Movie Theater from us. It means that this template has not been sold before and you become an owner of a unique design. After this kind of purchase the template is being permanently removed from our sales directory and is never available to other customers again. The unique purchase license allows you to develop the unlimited number of projects based on this template, but the template should be customized differently for every project. After WP template for Culture News purchase you can put your copyright to the template. But you cannot place a line at the bottom (or any other spot) of the customized project saying "Website design by Company name". Nevertheless, you can place "Customized by Company name". Awesome template! But, I have been purchasing templates and template services from TemplateMonster and Tuning for 8+ years and great service. I have used other template services who also sell templates and their quality of customer service is not as exemplary as TemplateMonster. Great Job, TemplateMonster and I look forward to purchasing more templates and more customization services from you in the near future.